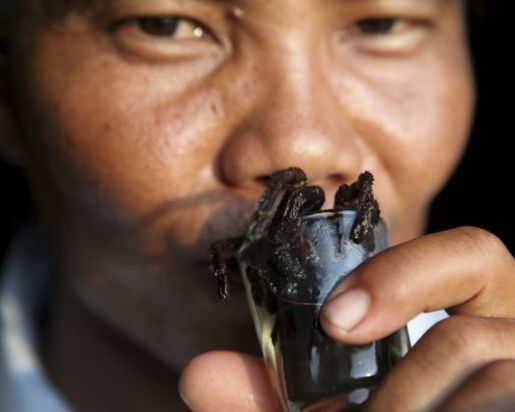 This Cambodian tuk-tuk driver is enjoying what people in his country believe is a heart-healthy drink with aphrodisiac powers: a tarantula cocktail. That’s right, it’s a noxious mixture of rice wine, jack fruit, and spider entrails, with the spider being alive until he ends up in the glass. Mmm, tasty! Tim Whitby captured the drink, as well as the driver. Cambodia has had a vigorous spider-food trade since the 70’s, but it’s only recently that mystified Westerners are getting a chance to join the locals on spider-hunting tours and try the snacks (either in drink form or fried) alongside the friendly locals. Would you try the local dish of choice? As for me, I, uh… I think I’ll pass, thanks. My heart and libido are healthy enough; I don’t need to make things worse by consuming a pulpy mass of spider entrails.